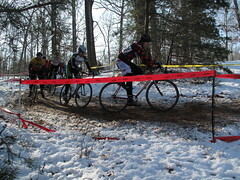 The eleventh Capital ‘Cross Classic took place December 6 at Lake Fairfax Park in Reston, Virginia. Masters 3/4 Field. Photo by Jen Franko. Early morning ice and a layer of fresh snow turned to mud and slop as the day progressed. Conditions that make for a fun day of racing but not ideal for filming. The helmet-cam made it about 15 seconds into the race before getting tagged with a small glob of mud. The rear-view camera, surprisingly, fares a little better. For a couple minutes, at least. Music this week is by Blackie Knight. Sadly, I believe they have disbanded. But the tracks rock. So go to the MySpace page and tell them to get the band back together. Quite the creative line on the last corner. Amazing how much that course changed with each race. That looked completely different than what I saw in my race an hour later. Thanks as always for the video. Great racing with you this season. See you next year! Love how you covered up your tantrum just after the first barriers when the LOUD MUSIC starts (you know, when you ran yourself into the tape). Swearing repeatedly “F-YOU” in front of kids and other spectators because a guy takes the inside line on you in a corner – not so sporting. Covering it up in your video – even more weak. It’s bike racing friend, leave the road rage on the beltway. Consider yourself called out & _Please_ learn how to corner without blaming your poor skills on others. that would have been PUNK!